Levity Novelty LLC has today released an iPad app that provides simulated invisibility of the iPad 2 screen on a table or other environment, even as the device is moved, using its unique motion sensing technology. The Invisibility™ app is available in Apple’s online App Store for US $0.99. Levity Novelty LLC has today released an iPad app that provides simulated invisibility of the iPad 2 screen on a table or other environment, even as the device is moved. The Invisibility™ app is available in Apple’s online App Store for US$0.99. The Invisibility user simply takes a photo of the table, then lays the iPad flat on the table or lifts one corner. As the user rotates the iPad around its center, or a corner, a perfectly stationary image of the table underneath remains clearly visible. By all appearances, the screen has disappeared and the user is looking through the iPad as it moves. Users can even see the inside edge of the iPad through the screen, as well as shadows seemingly cast on the table by the empty iPad frame. From the Arabian Nights to the Lord of the Rings and Harry Potter’s cloak, storytellers have dreamed of invisibility. Magicians use mirrors and sleight of hand to astonish audiences and make objects disappear. While the Invisibility iPad app can’t yet be adapted to the size and flexibility of a garment or cloak, its core method – combining cameras, motion tracking software, and a large display – can some day be combined to make a greater range of objects disappear. Together with the motion-detecting accelerometers built into all of Apple’s iOS mobile devices, and the iPad 2’s high performance graphics, Invisibility draws over a hundred “stationary” images each second as the iPad moves, giving the table top image – or any other image the user chooses – a fixed reality whose location and orientation are seemingly independent of the iPad. The iPad becomes a moving window into a virtual world. The launch of Invisibility today also marks the introduction of app maker Levity Novelty LLC’s patent pending Pantomime™ software technology. Pantomime achieves its illusions by combining real-time 3D motion sensor information with software models of the iPad’s size, shape, and other dimensions, including the locations of its corners and its screen. Pantomime™ is named for the technique mimes use to create the illusion of a stationary object or environment through body motion. By holding one arm perfectly still in mid air as he moves the rest of his body, a mime convinces viewers he’s leaning against a wall or table. Invisibility, the first app to incorporate Pantomime™, is aimed at consumers who love technology and delight in the kinds of magical experiences enabled by devices like the iPad. Tricks like Invisibility’s transparent iPad can be used to fool or astonish friends. For example, rubbing a seemingly ordinary iPad home screen can gradually reveal the table underneath. Since the Invisibility app can turn any picture into a seamless, endless environment with other images scattered over it, many other gags, illusions and magic tricks are possible. Instant magicians have used the basic Invisibility app for Teleportation, Time Travel, Thought Reading and similar gags, typically with just a minute of preparation. The Invisibility app includes a bonus experience: a Table Top Gallery made from the user’s Album photos – an animated virtual world with physics like momentum and friction. By moving the iPad, the user can navigate photos scattered across a virtual table much larger than the screen. 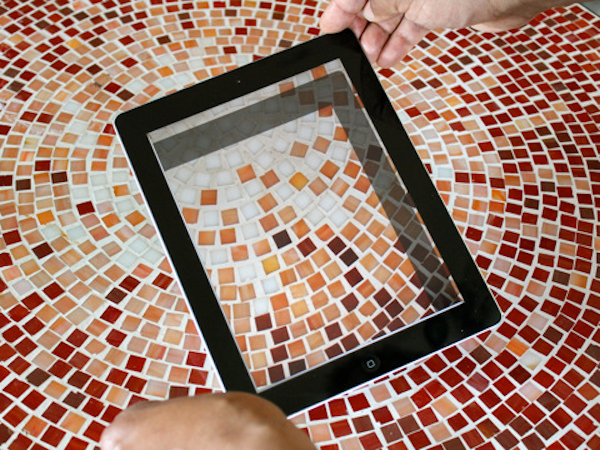 Users can move, zoom, toss and spin the photos with iPad multi-touch gestures. Users can also move, turn, and vastly shrink and stretch the background, confirming that it is both infinite and seamless. The results can be gorgeous, disturbing – or hilarious. Reflections turn landscapes into desert lakes, sunsets into multi-sun Tatooine skies. In a single pinch, a pretty girl can become stunning, symmetrical fantasy twins – then nightmarish conjoined octuplets. And throughout, the iPad remains a moveable window into worlds made from any photo you’ve taken with the iPad’s camera, or from Albums ordinarily viewed with its built-in Photos app. The Table Top Photo Landscapes offer Invisibility users a glimpse of the kinds of interactive virtual worlds, games, and other experiences Pantomime makes possible. Levity Novelty offered an April Fool’s peek at Invisibility, which received thousands of downloads on April 1st with an average rating of 5 stars in the App Store. The release version of Invisibility is available today for US $0.99 at the App Store. Levity Novelty LLC, maker of iPhone and iPad apps to startle and delight, was founded by Dr. David Levitt in 2009. Dr. Levitt was the founder and CEO ConnectedMedia and Hip Software, maker of award winning Macintosh applications. ConnectedMedia’s ConnectedTV, one of the first “touch” apps designed to tap and stroke with your fingers, turned a Palm PDA into a web powered, personalized TV guide and remote control. Dr. Levitt received his doctorate in Artificial Intelligence and master’s degree from MIT, after graduating from Yale at age 20. He has been a research scientist, software developer and lecturer at the MIT Media Lab, Atari Research, Interval Research and NYU’s Interactive Telecommunications Program. In 1990 he joined the team at VPL Research that invented Virtual Reality, developing granted patents in VR technology.